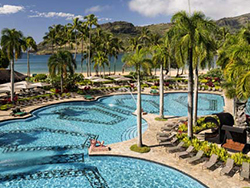 Warm island hospitality meets the idyllic location of the Garden Isle at the stunning Kaua'i Marriott Resort. The only hotel on the white sands of Kalapaki Beach fronting Nawiliwili Bay, the resort is centrally located to many of the island's outdoor activities, and was recently named one of Travel & Leisure's World's Best Family Hotels. The resort features 356 large guest rooms with spectacular ocean, pool, or lush garden views. Its iconic pool offers 26,000 square feet of lounging and relaxing. The Resort Activities Schedule features a robust calendar of unique experiences daily, including music, crafts, storytelling and cultural activities. From sushi to Italian to Hawaii Regional Cuisine, a variety of creative culinary experiences are located on the resort, all with stunning ocean views. Kaua'i Marriott Resort has a private access road to the airport, located 1 mile away, and 24 hour courtesy airport transportation. Kauai stands out as the vacation destination of choice, blending the enchantment of ancient Hawaii with all modern conveniences. Kayak on the same river where Indiana Jones escaped, or windsurf with playful spinner dolphins swimming at your side. Enjoy a whalewatching expedition, or explore exquisite waterfalls on a scenic helicopter tour, or from a zodiac craft. Sportfishing, scuba diving, and snorkeling are all popular in the pristine waters off the incomparable coasts. Horseback riding offers breathtaking vistas from the mountains to the beaches. Kauai is a magnificent natural setting for golf. Kauai is home to many top-ranked courses as Golf Digest rates four of the championship golf courses among the top seven in the State of Hawaii and Wailua Municipal Golf Course consistently ranks in the top 100 municipal courses in the country. Offer valid for booking and select travel now through 5/6/19. Rate is per person, land only, based on double occupancy for check-in on 5/1/19, in room categories listed. Unless otherwise indicated: rates quoted are accurate at time of publication, & are per person, based on double occupancy. Airfare, taxes, surcharges, gratuities, transfers & excursions are additional. Advertised rates do not include any applicable daily resort or facility fees payable directly to the hotel at check-out; such fee amounts will be advised at the time of booking. Rates, terms, conditions, availability, itinerary, government taxes, surcharges, deposit, payment, cancellation terms/conditions & policies subject to change without notice at any time. Cruise rates capacity controlled. Other restrictions may apply, including, but not limited to baggage limitations & fees, standby policies & fees, non-refundable tickets & change fees with pre-flight notification deadlines, & blackout dates. Fees & policies vary among airlines. Contact your travel advisor for details or questions. Not responsible for errors or omissions.